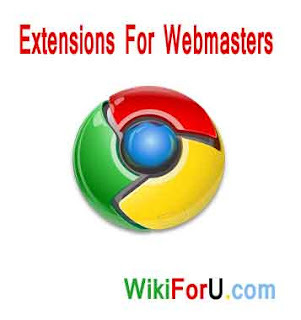 Top Recommended Extensions for Webmasters and bloggers. Check them out and Grow your online business. Google Chrome is one of the best browsers of World. It has defeated Mozilla and Microsoft's I.E. It has many new features, has a very little start up time, fast loading time and much more. The one another reason is "Google Chrome Extensions" which are available on Google chrome's web store for free. There are thousands of extensions available on internet. So it looks too bad and difficult to check them all. Therefore i am going to write this article for webmasters and freelancers, who wants to do more with their blogs and websites. If you ever tired in choosing best colors for your blog. Then try this extension. No need of any advanced techniques. just download and install it. This extension will help you choose different - different color schemes for your website. Click on the title above and this will take you to the download page. This is my most favorite extension. This is full of amazing features. Some of these are : It provides the CSS code for choosen fonts. So choose the font faces, size etc according to your needs and copy the css code to use in your website. This is must for Web Developers. The main thing in this is that this is created by the developer of Mozilla Firefox's Web Developer Add on maker. So it is genuine. It gives so many features to web application developers. Click on above link to goto chrome web store and install it from there. As the name suggests that this extension helps us to determine speed or page load time related problems. Your website must load very quickly, so the users or reader should not annoy. This extension helps to check the causes of high load time and also helps to solve them. This is very simple to use and user friendly. As a webmaster you may know the importance of SEO (Search Engine Optimization). This is must to have good rankings. This extension helps webmasters and website owners to check their SEO status and gives suggestions. This is the most downloaded SEO extension for Google Chrome.